We know that parking downtown can be a challenge, but we don’t want that to stop you from visiting us! 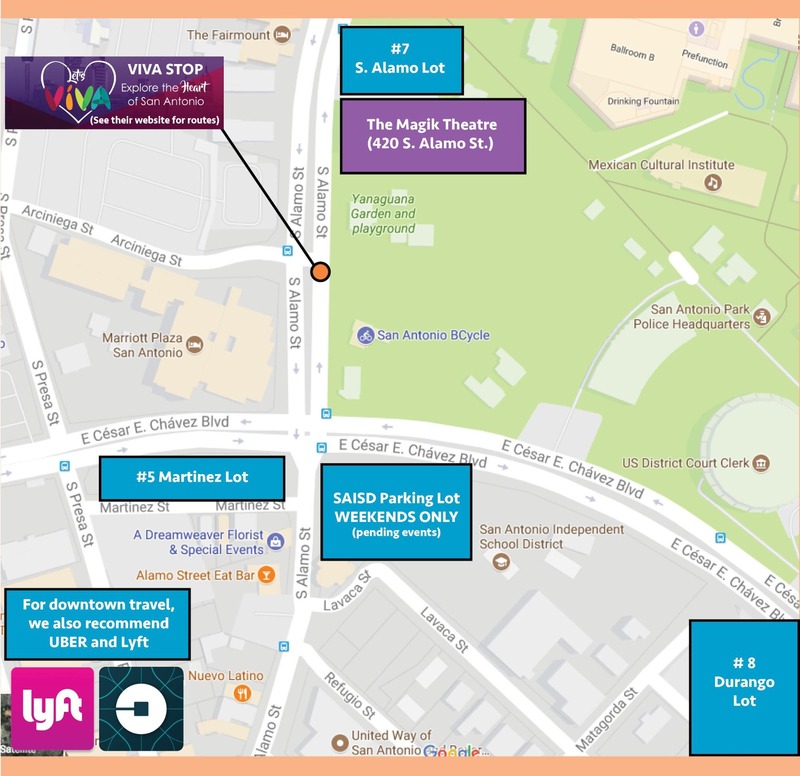 The Magik Theatre does not have parking of it’s own, but we recommend the following resources for parking. You can call us at 210-227-2751 with any questions or concerns and our friendly box office staff will do their best to assist you. Please be courteous of other drivers and cautious of pedestrians (especially little ones) while you search for parking. #5 MARTINEZ LOT – corner of S. Alamo St. and Martinez St.
#7 S. ALAMO LOT – 418 S. Alamo St.
We can also be reached by taking the VIVA routes, part of VIA’s downtown transportation initiative. There is a stop right outside the theatre! Use this interactive map to help you find up to date parking information. There are additional independently-owned paid parking lots in the area that are within walking distance. The Magik Theatre has no control over the rates charged at any of the recommended lots. Please see the sites provided for the most current information available. We will do our best to keep patrons up to date on all events that may add additional challenges to parking.